Well, the Olympics and hand sewing just seem to go together like peas and carrots. This week has been full of handstitched! I'll have to show you everything via Instagram photos because my poor camera broke. Luckily it was not anything fancy, but Will dropped it while the zoom lens was out and it is now stuck and won't turn on. My husband thinks this is part of my master plan to get a DSLR. I did some research online about how to fix it, but so far nothing has worked. So now I might scour ebay for something fancier, but maybe slightly used. First up is my most recent finish - a lovely little box pouch from the most amazing book, Hexagogo by Tacha Bruecher. Thank you so much for Karen, from Charlotte Modern Quilt Guild for suggesting this book at our little officer's meeting last month. I literally want to make everything in the book, however most projects are a bit more time consuming! I had so much fun making these little 1/2" hexies! 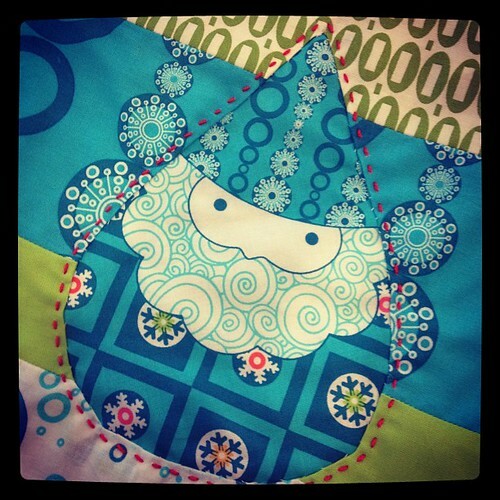 I also finished my Winterkist Blog Hop project, which included some more handstitching. My day on the hop is August 9, so you can see some more then! And finally, I basted and bound my Whole Cloth Quilt. This is the final project in the Stitched In Color Handstitched Camp. I am so excited that I finally found a "worthy" project to use some Anna Maria Horner Guest of Honor fabric from the long OOP Garden Party line. I just bought more perl cotton at JoAnn's today, so I should have some more handstitched to show you next week. 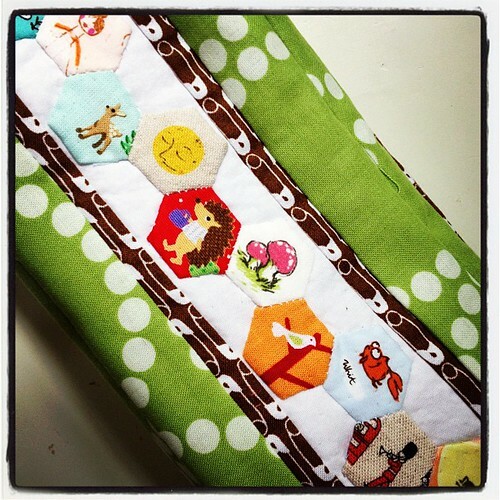 Today I am linking up with Katies' Handmade Parade! Those little hexagons are adorable. Sooooo cute! Hi Courtney - Your hexagon bag is fantastic! Yesterday I finished the needlebook project from that book. It was my first project from the book and it turned out great. I can't decide what to do next. The little 1/2" hexies are so teeny. 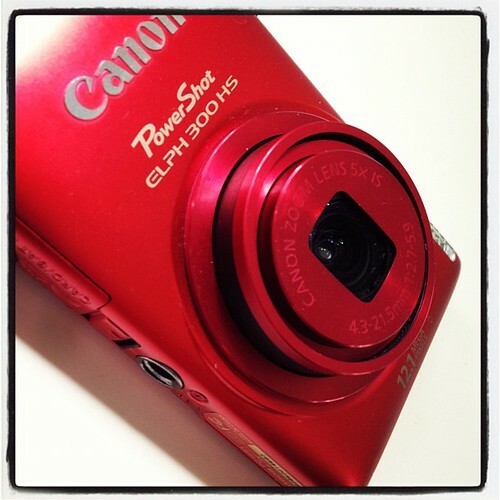 My son dropped my Canon camera in the canal at the beach last week. We fished it out but it never would work. I just ordered a new one from Amazon. I needed just a basic one but it was still a lot of research to determine what is new in the world of cameras. 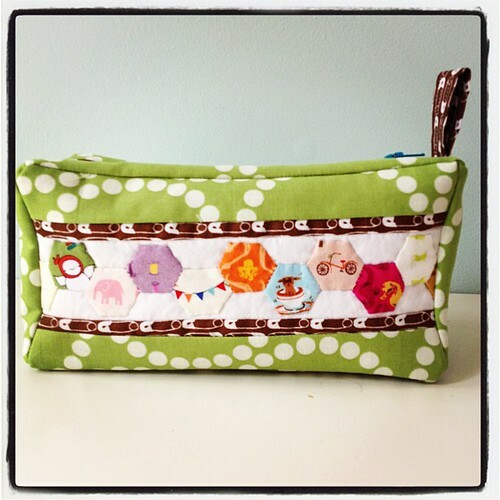 That's a cute pouch and love those tiny hexies! 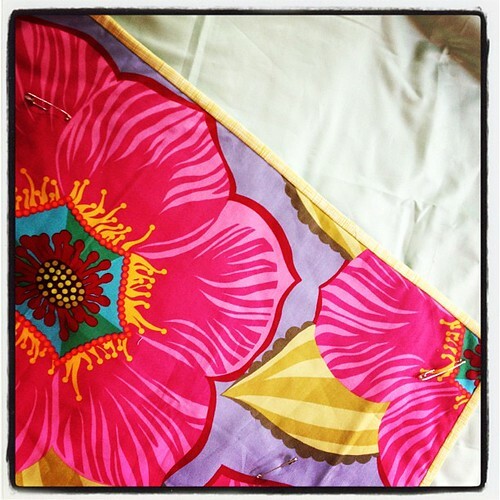 Look forward to seeing your hand quilting design for the wholecloth quilt! What cute hexies. The pouch is lovely. I a looking forward to seeing the rest of you blog hop project. Your hexagon bag is delightful! THAT is the cutest pouch ever! I pinned it. Hope that's OK?? And my tongue is wagging over that AMH fabric:) Bummer about your camera. 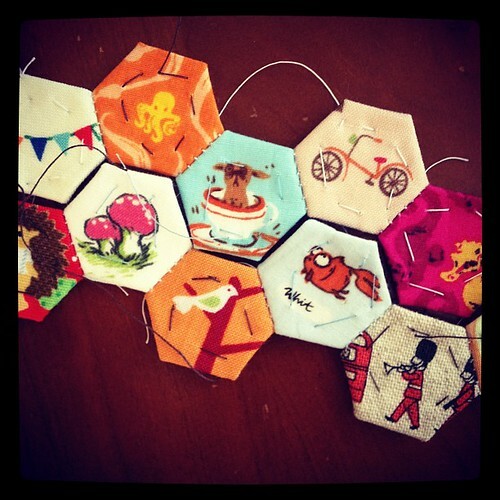 Holy geeze - those tiny hexies are the cutest!